When you contemplate the cost of building your timber frame home, you can think in terms of parts and pieces that go together such as; the foundation, the frame, and the roof, or you can think in Turnkey terms—considering the entire project as a whole. The term ‘turnkey’ originates from that final stage of a project when a homeowner “turns their key” and steps in to their completed home. 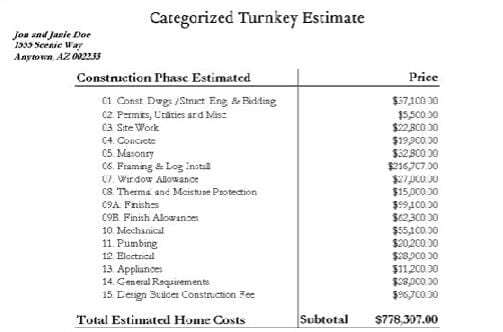 Your turnkey cost is an accumulation of what will be spent on your project from your initial design to the final touches. However, these costs do not include any land improvements that need to be made, utilities brought in, roads, or the cost of purchasing the land. Some Timber Frame companies will provide you package prices for your project and give you a percentage of how much your total cost will be. At Riverbend, we use turnkey estimates to help you see if the home design you have designed and chosen to build is feasible to build within your complete turnkey budget. By thinking in terms of turnkey costs, you will have an understanding of how much it will actually cost to build your home upfront, giving you the confidence to move forward into construction.